Decorated with a yellow ribbon and the colors of the American flag, our personalized Blue Star frames honor the dedicated men and women who unselfishly serve in America's armed forces, both at home and overseas. These frames help military families keep soldiers close to their thoughts and include room for one star for each armed forces member as well as additional personalization. What a great way to pay tribute to America's finest! Frame measures 8" x 10" and holds a 4" x 6" picture. 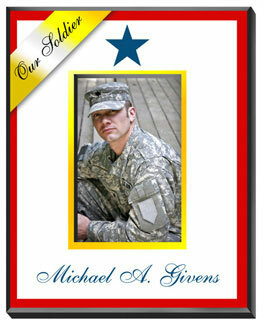 Accommodates names of up to three military family members and up to three stars.